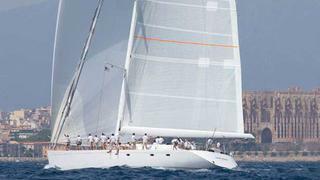 The 2014 Superyacht Cup, set in the waters off of Palma de Mallorca, Spain, has come to a close. This year's race saw ample competition in all the classes, including the always beautiful to watch J Class superyachts with a fleet of five in attendance. After three days of exciting racing action – plus an extra day of competition just for the Js – the Superyacht Cup came to a close yesterday with a clear leader overall. The Frers-designed 34.2 metre Royal Huisman superyacht Unfurled has been named overall winner with a score of 2, 1, and 1 in Class 2. The winning team was a family affair, with four families sailing on board Unfurled including father and son Ross and Campbell Field. The Tripp-designed Wally yacht Saudade finished in top spot in yesterday's race in Class 1, but her total score was not enough to beat out the new 46m Vitters superyacht Ganesha, who won first in her class and second overall in the entire Superyacht Cup. Not bad for her fourth-ever regatta. Claasen can be proud that two of its yachts took top spots in their respective classes. Its J Class superyacht Lionheart also won in the J division, with J Class yacht Ranger coming in second and J Class yacht Hanuman third overall.